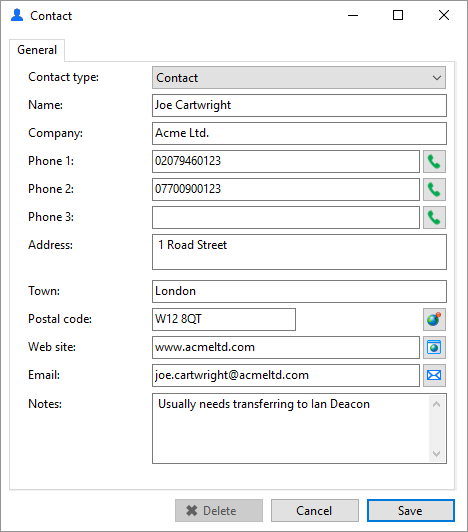 All of the boxes from the Contact window, including the Notes box at the bottom, can be searched. 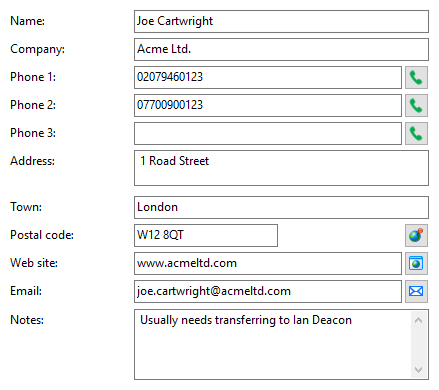 You can also interact with some of the boxes to make a call, send an email, etc. This is used to change the format of the Contact window. Different "types" have different templates. Pick the one that best represents the contact entry that you are creating. Enter the contact's details into these boxes. Click this button to dial the telephone stored alongside. Click this button to open an online map of the area specified in the box. Click this button to open the website specified in the box. Click this button to compose an email to the stored email address in your default email client. Click this button to permanently delete this record and close the window. Click this button to discard any new information that has been entered or edits that have been made and close the window. Click this button to save any new information that has been entered or edits that have been made and close the window.